Draft: 2010, Washington Nationals, 1st rd. All-Area Code Team) and International High School Power Showcase Home Run Derby (2009 Ryan Howard Award)…Signed by: Mitch Sokol. Named a National League All-Star starter for the third straight year and was on his way to contending for his second National League MVP Award before suffering a hyperextended left knee on Aug. 12 vs. SFG...The injury cost him 41 games and left him just shy of qualifying for league leaders...At the time of his injury, he ranked in the NL in OPS (2nd, 1.034), go-ahead RBI (1st, 29), runs scored (2nd, 92), game-winning RBI (T3rd, 14), on-base percentage (4th, .419), home runs (T4th, 29), average (4th, .326), slugging percentage (4th, .614), total bases (4th, 247), extra base hits (5th, 57), walks (T5th, 66), RBI (6th, 87), and doubles (T8th, 27)...He returned from the disabled list on Sept. 26 and was in the lineup as the Nationals faced the Cubs in the NLDS...14 of his 29 HR came with two strikes, tied for eighth in MLB (T1st in NL)...Homered on Opening Day, marking his fifth career Opening Day home run...Clubbed two walk-off home runs, both against Philadelphia: April 16 (Benoit) and May 13 (Ramos)...Tied his own record of nine home runs in the month of April (2013, 2015)...Was named National League Player of the Week on April 23 after hitting .550 (11-for-20) with four doubles, three home runs, seven RBI, seven walks and ten runs scored during the week...Hit .391/.509/.772 with eight doubles, nine homers, 26 RBI, 22 walks and 32 runs scored in April, but was edged out by teammate Ryan Zimmerman for NL Player of the Month honors...Recorded a career-high 19 game hitting streak, July 1 - July 27...On July 27 vs. Milwaukee, he joined Wilmer Difo, Ryan Zimmerman and Brian Goodwin in clubbing back-to- back-to-back-to-back home runs -- tying a Major League record for consecutive home runs (joining seven other clubs) and marking the first time in franchise history a Nationals or Expos team had accomplished that feat...He clubbed a second home run in that game, the third multi-home run game of the month, tying a franchise record (Nationals/Expos) for one calendar month (Rusty Staub, Aug. 1970 & Vladimir Guerrero, Sept. 2000)...Was one of 10 Nationals to hit at least 10 home runs, tied for the most of any club in the NL and the second-most of any club in the Major Leagues (Houston, 11)... Clubbed his 150th career home run on Aug. 7 at Miami... He became the 14th player in MLB history (since 1913) to hit 150 career home runs before turning 25 years old...Moreover, according to the Elias Sports Bureau , only two active MLB players connected 150 times at a younger age: Albert Pujols (24 years, 212 days) and Giancarlo Stanton (24 years, 290 days)...At 24 years, 295 days, Harper and Mike Trout both connected on their 150th home run at the same exact age...Coupled with Ryan Zimmerman's go-ahead homer later in the inning, it was the first game in Postseason history that a team won in its last time up on separate game-tying and game-winning home runs, according to the Elias Sports Bureau ...Clubbed his fifth career Postseason home run, a game-tying two run home run off Carl Edwards Jr. in the eighth inning to help propel Washington to the 6-3 win. Followed up his 2015 MVP season by securing his first career 20 home run/20 stolen base season...It was the fifth 20/20 season in Nationals history...Ranked tied for fourth in MLB (T2nd in the NL) with 108 walks...Was named National League Player of the Month in April after hitting .286, with nine home runs, 24 RBI, 17 walks, five stolen bases and 16 runs scored...Also earned Player of the Week honors, April 11-17...Clubbed his 100th career home run (first career grand slam), April 14 vs. Atlanta (Teheran)...Harper joined Ryan Zimmerman and Ian Desmond as the only players in Nationals history (2005-present) to eclipse the 100-homer milestone in a Nationals uniform...He followed his 100th longball with another in each of the next three contests, setting a new career high and matching a Nationals record with home runs in four straight games...With home runs in all three games the Nationals played in Philadelphia April 15-17, and dating back to 2015, Harper tied Ernie Banks (1955) as the only visiting players in MLB history to homer in six straight games in Philadelphia...Hit game-tying, ninth-inning, pinch-hit home run, April 24 vs. MIN (Jepsen), his first career pinch-hit home run...During four-game series at Chicago, May 5-8, walked 13 times, the most by any player a four-game series dating to 1913, per STATS Inc... Harper broke a record that had been in place for nearly 86 years...Walked six times in the series finale, setting a modern MLB record (since 1900) for the most plate appearances without an at-bat in a single game: in his seven trips to the plate, Harper walked six times and was hit by a pitch...Started in the NL outfield for the third time in his career, his fourth career All-Star selection, by garnering 2,865,095 fan votes -- the highest vote total among all NL outfielders...Harper joined Hall of Famers Gary Carter (4) and Andre Dawson (3) as the only players in franchise history (Nationals/Expos) to earn at least three fan elections to the ASG...Harper went 1-for-2 with a double off Texas LHP Cole Hamels in the game...Was issued an intentional free pass to first base 20 times this season, most in MLB and a Nationals record (2005-pres.) for a single season...According to FanGraphs.com, ranked first among NL right fielders in "outfield arm runs saved" and second in UZR (7.9) behind only CHI right fielder Jason Heyward (15.8). Assembled one of the most remarkable seasons in Major League Baseball history en route to being unanimously selected as the 2015 National League Most Valuable Player, the seventh unanimous selection in MLB history...Led Major League Baseball and the National League in a majority of the significant offensive categories (see info boxes that follow)...Hit .330 with 38 doubles, one triple, 42 home runs, 99 RBI, 124 walks, six stolen bases and 118 runs scored...Posted a .460 on-base percentage, .649 slugging percentage and a 1.109 OPS...Seamlessly transitioned to right field after playing left field & center field early in career...Ranked eighth among National League outfielders in defensive runs saved (10), according to FanGraphs.com...Was named to his third National League All-Star team, garnering 13,964,950 fan votes, the most votes of any player ever to appear on the National League ballot and third-most votes for any player in MLB this season...It was his third career All-Star Game selection and his second career All-Star start...Was the first three-time All-Star in Nationals history (2005-present), is also the first Nationals player to claim multiple fan elected starting assignments...Played in a career-high 153 games...Five multi-home run games in 2015 were the second most in a season in Nationals history (A. Dunn - 6 in 2010)...Collected three National League Player of the Week awards and one National League Player of the Month (May) award. Was limited to 100 games after injuring his left thumb while sliding into third base, April 25 vs. SDP...Had surgery to repair UCL in left thumb, April 29 in Cleveland (Dr. Graham)...Was 5-for-11 with a double, triple and four RBI in the three games leading up to the injury...During the game in which he sustained the injury, posted a career-high four RBI...Returned to action on June 30 after missing 57 games...Hit .268 with six doubles, 12 home runs, 23 RBI, 30 walks and 33 runs scored from that point until the end of the season...10 of his 13 homers on the season were hit in final 47 games, Aug. 7 - season's end...Three of 13 HR came at expense of left-handed pitching (hit 2 vs. LHP in 2013)...Over the final 27 games of the season, hit .319 with a .379 OBP, .532 SLG while hitting two doubles and six home runs...Hit second career game-ending homer, a two-run shot in the 13th inn., to beat the Mets, 5-3, Aug. 7 in D.C....Again shined in the Postseason, clubbing three home runs (two off Hunter Strickland)... Towering solo home run off Strickland in the seventh inn. of Game 4, tied the game at 2-2. Fought through numerous bumps/bruises to hit .274 with 24 doubles, 20 homers and 58 RBI in 118 games...at age of 20, became youngest player to start a game for the National League in All-Star history...finished 2nd in Century 21 Home Run Derby to OAK's Yoenis Cespedes...13 home runs at Nationals Park tied Jayson Werth for team lead...paced the NL with a 1.152 OPS in interleague play...posted a .374 OBP and hit 14 of 20 home runs while hitting in the 3-hole in Davey Johnson's lineup...homered twice and scored 100th career run in a 2-0 Opening Day victory, April 1 vs. MIA...went 3-for-3 with a double, 2 home runs, 3 RBI, 3 runs and a walk en route to a career-best 10 total bases in a 7-6 win on April 20 at NYM...missed 31 games (May 27-June 30) with left knee ailment that required debridement procedure, Oct. 23 in Vail, CO...OPS before DL stint was .976, after .789...in return from 31-game DL strint, sparked a 10-5 win vs. MIL with a opposite-field home run in first at-bat in first inning, July 1...doubled, posted 3 RBI (including 100th of career), scored a run, walked twice and made a game-saving diving catch in the 9th inning as Washington held on for an 11-10 win on Aug. 23 at KCR. Was named NL Rookie of the Year by the BBWAA after hitting .270 with 26 doubles, 9 triples, 22 homers, 59 RBI, 56 walks and 98 runs scored in 139 games...earned award despite being a true rookie and not making MLB debut until late April...22 homers as a teen ranked 2nd on all-time list behind only Tony Conigliaro (24)...ranked 5th in NL in runs...led NL rookies in runs, OPS (.817), GWRBI (12) and extra-base hits (57)...when posting at least one RBI, Washington went 30-8...when scoring a run and/or homering, the Nationals finished 55-19 and 15-5, respectively...was named NL Rookie of the Month in May (.271, 13 extra-base hits, 10 RBI) and Sept./Oct (.330, 18 extra-base hits, 1.043 OPS)...began '12 with Triple-A Syracuse, but made memorable MLB debut, April 28 at Dodger Stadium, finishing 1-for-3 with one RBI in a 10-inning, 4-3 setback...doubled to center field off Chad Billingsley in the 7th to notch first hit, and in the 9th, lifted a go-ahead sac fly that would have been the GWRBI, but LAD rallied to tie the game in the bottom of the 9th...in 54th at-bat, hit first career home run, a solo shot to dead center field off Tim Stauffer, May 14 vs. SDP. Combined to hit .297 with 24 doubles, 17 homers, 58 RBI and 26 stolen bases in 109 games with Double-A Harrisburg and Single-A Hagerstown ... began season with Hagerstown ... batted .318 with 17 doubles, 14 home runs, 46 RBI, 46 runs and 19 steals in 72 South Atlantic League games ... earned mid-season SAL All-Star selection ... received MiLB.com SAL Player of the Week honors, May 9 ... earned promotion to Double-A Harrisburg on July 4 ... in July, was selected to play in Futures Game, as part of All-Star weekend in Phoenix ... at season's end, recognized by Baseball America as the top prospect in both the Double-A Eastern League and the Single-A South Atlantic League ... following the season, played with the Scottsdale Scorpions in the Arizona Fall League ... hit .322 with six homers and 26 RBI in 24 AFL contests. Professional: Signed late, but participated in the Florida Instructional League and the Arizona Fall League...in theInstructional League, led the Nationals in home runs (4), RBI (12) and OPS (1.110)...went 15-for-47 (.319) in firstexposure to pro ball...graduated from there to the Arizona Fall League...was the 2nd-youngest player in AFL history (NYM'sFernando Martinez was slightly younger)...as a member of the Scottsdale Scorpions taxi squad, hit .343 (12-for-35)with 3 doubles, 2 triples, a homer and 7 RBI in 9 AFL contests...went 1-for-4 with a double and 2 RBI in professionaldebut, Oct. 20 vs. Mesa...hit first professional homer, a 2nd-inning solo shot, off SDP's prospect Erik Davis on Oct. 30at Scottsdale Stadium...helped Scottsdale claim the AFL championship. Amateur: At age of 17 (should have been a high school junior), hit .443 (101-for-228) with 23 doubles, 4 triples, 31homers, 98 RBI, 39 walks and 20 stolen bases in 66 games for College of Southern Nevada in the Scenic West AthleticConference, which uses wood-bats...despite being the youngest player in the SWAC, posted .526 and .987 on-base andslugging percentages, respectively, en route to a stellar 1.513 OPS...led team and conference in virtually every primaryoffensive category...was named 2010 SWAC Player of the Year and also earned First-Team SWAC All-Conference status...the aforementioned 31 home runs in 2010 set a College of Southern Nevada single-season mark, easily besting theformer record of 12, which was set during CSN's era using aluminum bats. 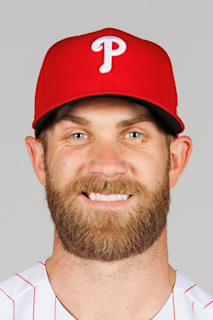 March 2, 2019 Philadelphia Phillies signed free agent RF Bryce Harper. October 29, 2018 RF Bryce Harper elected free agency. September 26, 2017 Washington Nationals activated RF Bryce Harper from the 10-day disabled list. August 13, 2017 Washington Nationals placed RF Bryce Harper on the 10-day disabled list. Hyperextended left knee. June 4, 2017 Washington Nationals activated RF Bryce Harper. May 31, 2017 RF Bryce Harper roster status changed by Washington Nationals. May 15, 2016 Washington Nationals activated RF Bryce Harper. May 14, 2016 RF Bryce Harper roster status changed by Washington Nationals. June 30, 2014 Washington Nationals activated RF Bryce Harper from the 15-day disabled list. June 26, 2014 Washington Nationals sent LF Bryce Harper on a rehab assignment to Harrisburg Senators. June 22, 2014 Washington Nationals sent LF Bryce Harper on a rehab assignment to Potomac Nationals. April 27, 2014 Washington Nationals placed LF Bryce Harper on the 15-day disabled list retroactive to April 26, 2014. Left thumb sprain. July 1, 2013 Washington Nationals activated LF Bryce Harper from the 15-day disabled list. June 27, 2013 Washington Nationals sent LF Bryce Harper on a rehab assignment to Harrisburg Senators. June 25, 2013 Washington Nationals sent LF Bryce Harper on a rehab assignment to Potomac Nationals. June 1, 2013 Washington Nationals placed LF Bryce Harper on the 15-day disabled list retroactive to May 27, 2013. Left knee bursitis. April 28, 2012 Washington Nationals recalled Bryce Harper from Syracuse Chiefs. March 18, 2012 Washington Nationals optioned Bryce Harper to Syracuse Chiefs. October 3, 2011 Bryce Harper roster status changed by Washington Nationals. September 12, 2011 Harrisburg Senators activated RF Bryce Harper from the 7-day disabled list. August 20, 2011 Harrisburg Senators placed RF Bryce Harper on the 7-day disabled list. July 14, 2011 Harrisburg Senators activated RF Bryce Harper from the temporarily inactive list. July 8, 2011 Harrisburg Senators placed RF Bryce Harper on the temporarily inactive list. July 4, 2011 RF Bryce Harper assigned to Harrisburg Senators from Hagerstown Suns. March 12, 2011 Washington Nationals optioned Bryce Harper to Hagerstown Suns. October 13, 2010 OF Bryce Harper assigned to Scottsdale Scorpions. October 13, 2010 Bryce Harper roster status changed by Washington Nationals. August 16, 2010 Washington Nationals signed RF Bryce Harper.